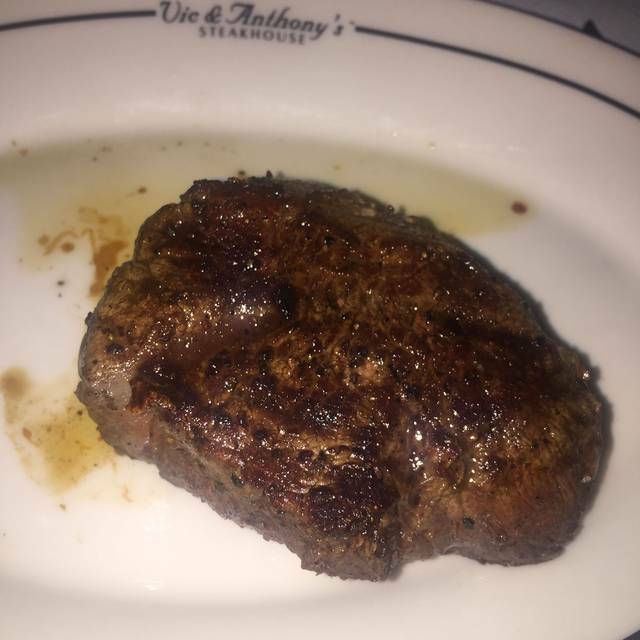 You must make reservations at least 5 minutes in advance of the time at Vic & Anthony's Steakhouse. Free valet parking is available at the Golden Nugget main entrance. Ask your server to validate your ticket. Overnight Hotel Parking also available for guests. 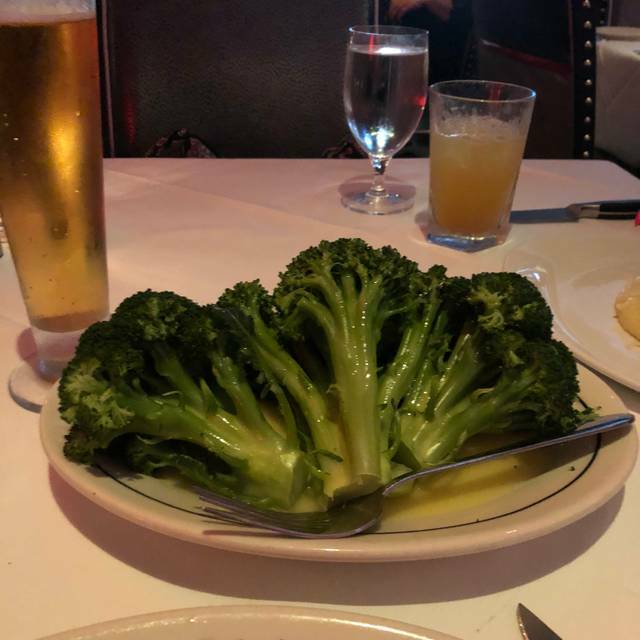 Atlantic City’s finest dining experience, Vic & Anthony's Steakhouse, introduces a legend to the people of New Jersey. With the right recipe for both comfort and class, Vic & Anthony's features a blend of distinguished cuisine and a one-of-a-kind atmosphere that is timeless yet modern. Our award-winning menu from acclaimed Concept Chef Carlos Rodriguez boasts only the finest prime beef, including Ribeye, New York Strip, Porterhouse and Filet Mignon. For those with a taste for something other than beef, we also offer Lamb Rack, Veal Chop, Live Maine Lobster, Australian Rock Lobster Tail and local fresh seafood fare. To top the evening off, enjoy a selection from our celebrated wine list, offering the most exquisite wines the world has to offer. The food is always excellent! One of my favorite places to eat. Liz is an excellent server! Excellent place for DATE NIGHT... perfect 8 oz. filet mignon. This is by far my favorite place to eat at the shore. They have the best steak I have ever tasted in my life. They never disappoint. The bone in Rib Eye is PERFECT. Almost as good as the Service. LOL. Excellent food with excellent service, every time!! I consider myself a foodie and absolutely love steak. 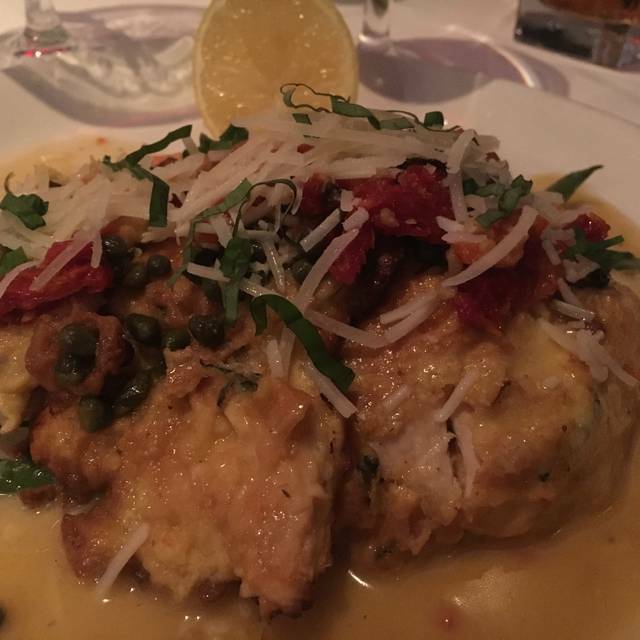 We have eaten at just about every 5-star restaurant and Vic & Anthony’s is #1. It’s literally the best steakhouse I have ever been to. We are here once before and fell in love with the place and came back a second time a month or so later and they did not disappoint. 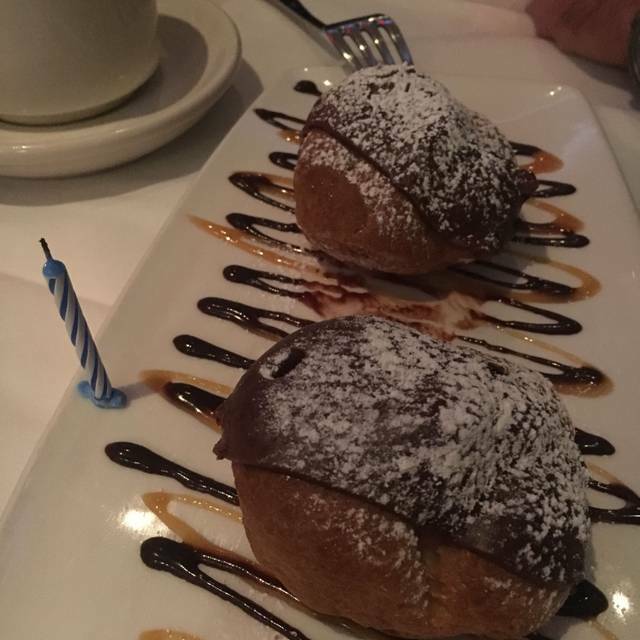 We were visiting AC to celebrate my daughter’s birthday with the family and the staff there went over and above to make our dinner perfect. The service was excellent and the food is just simply AMAZING! 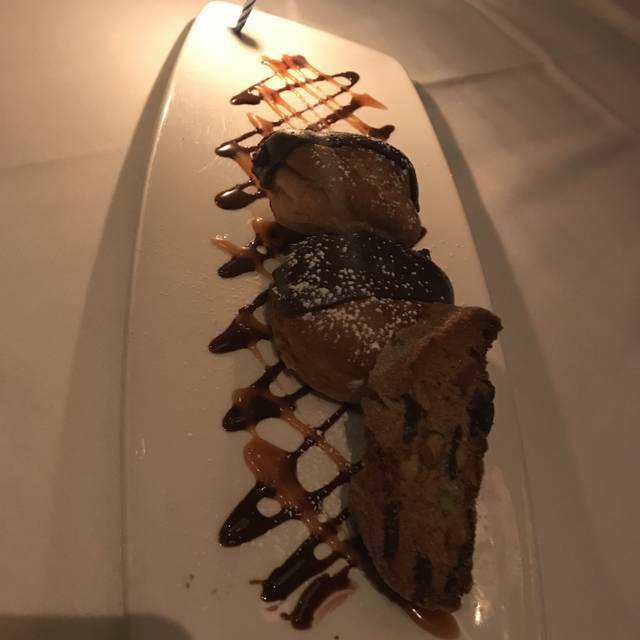 Steaks perfectly cooked, great selection, delicious desserts, and excellent service are all reasons why I give this place 5 stars. I just wish I knew about this place so I could have enjoyed their food earlier. Only drawback is that it’s located in the golden nugget. It’s not too far from Borgata/Harrah’s, but if you’re on the strip, you’ll have to take a cab or drive over. But it’s definitely worth the trip. Waitstaff seemed rushed. Large parties in dining area causing great amount of noise. Needed to shout over it all. Food excellent, came out quickly, hot. Would suggest angel hair with shrimp scampi instead of large spaghetti. Pavlova was delicate and perfect for dessert. Lastly our table for 2 was at the end of the wine case. During the 1.5 hrs there every person from the waitstaff bumped into my chair every time they past by. Think maybe the table shouldn’t have been placed there? Don’t think we’ll be going back anytime soon! Fantastic. Wonderful meal from start to finish. Staff was friendly and attentive. Would highly recommend. Food is fantastic and service top notch. Had a drink at the bar first and my Manhattan was spot on! Well done. Can’t wait to go back. Once again a fabulous meal. Never have been disappointed. Excellent experience. 4 filet mignons made 4 different ways were all made perfect. Victor the general manager is very personable. Laura the server was phenomenal. Went for Restaurant Week and ordered from that menu. What a great selection and the food was excellent! Portions were filling! The staff was friendly and extremely efficient and personable!! Looking forward to going again!! Our waiter Brian was fantastic. He was extremely effecient in every way. Service could have been better. We enjoyed a meal during the extended Restaurant Week in Atlantic City. Both of us ordered the Petit Filet (medium), mine was just right; my friend indicated that hers was a bit dry. We did not mention it to our waiter, Ricardo, who was attentive and polite and added to our pleasant experience. Going to a steak house isn't going to be inexpensive and this one is no exception. The service was wonderful. The meal was outstanding. Steaks were cooked to perfection. Adult beverages were modestly priced. A great place to dine on special occasions. 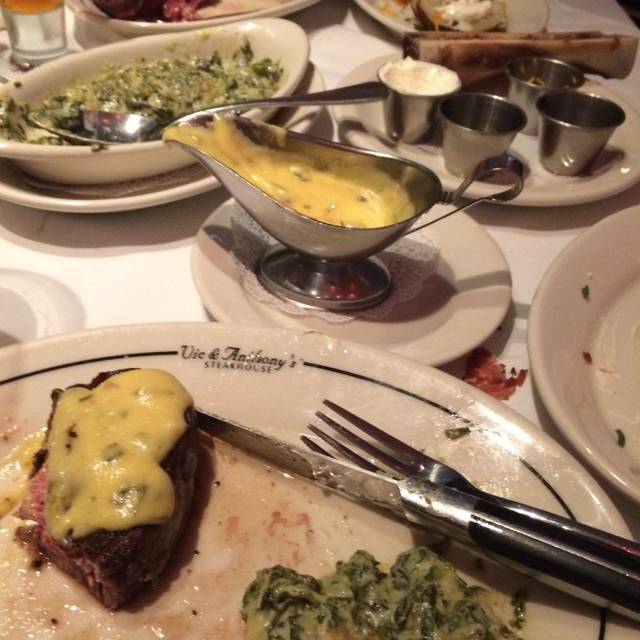 We've been to Vic and Anthony's many times and have always had perfectly-cooked steaks and good service, This time we took advantage of their Restaurant Week special filet mignon, adding a side of creamed spinach as well. No corners were cut just because they were running the special. Impeccable food and service. Nicely done, V&A's! My Fiancé and myself have been numerous times before. We invited some friends this time around and you did not disappoint. The food and waitress were wonderful. I can’t thank you enough. Although the Quality was Excellent, the Entree Portion sizes were disappointingly small. 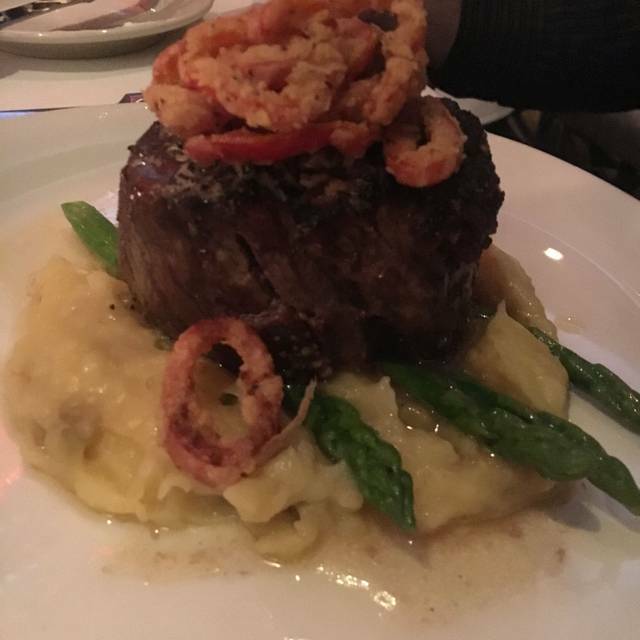 Even though it was AC Restaurant Week, why did Vic & Anthony's seem to skimp on the Entrees (Steak & Mashed potatoes-Potatoes don't cost much AND Shrimp Scampi- Bucatini pasta doesn't cost much)? 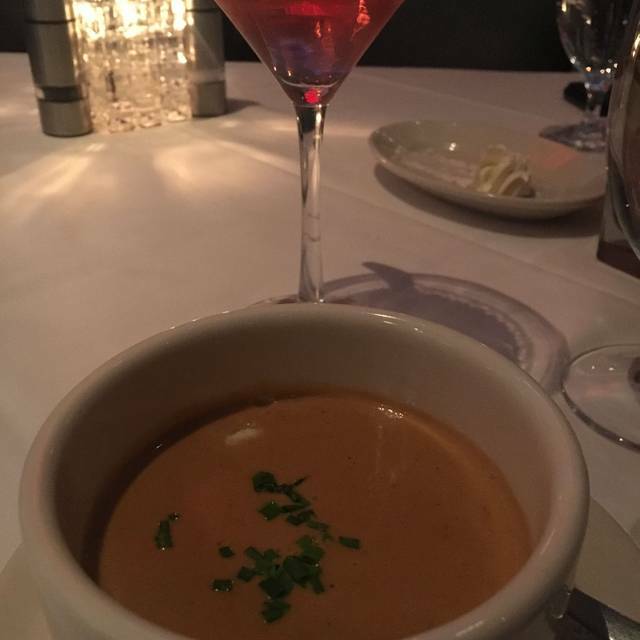 Entrees were still delicious, however, the Lobster Bisque and Cheesecake were the highlights of our meal. Had a great waiter and all staff very nice. Food was excellent!! went for restaurant week, which had a nice menu, order other things off regular menu mac & cheese out of this world. Absolutely top notch. Not the cheapest place but not over-the-top expensive for a fine dining steakhouse. Cooked and served to perfection. 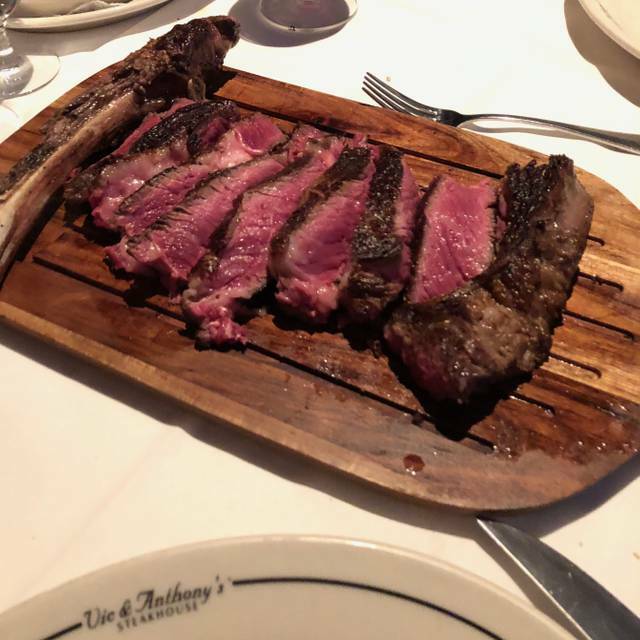 Bone-in Ribeye and Tomahawk Chop were the go-to’s and proved to be delightful choices. Best steakhouse in AC! Excellent staff and great ambiance. Great steaks and side dishes enough to feed 4 people Cheesecake excellent Lobster Bisgue good but should be hotter.Atlantic City restaurant week excellent value for dinner. A group of use went from work for restaurant week. Great selection, good portion sizes. Would go back. Four of us dined on March 5 during restaurant week. We were all extremely pleased with our entrees. The pasta in the shrimp scampi was cooked to perfectlion and the cheese cake was beyond creamy & delicious! The only reason I didn’t rate the experience five stars was because it was very noisy and service was a bit slow.